Yellow nutsedge was widely used in Egypt and groundnuts vases found in tombs of the pharaohs. Similarly, several Persian and Arabic authors mention in their writings digestive benefits and groundnut disinfectants. At that time it was used as a medicinal drink as it is very beneficial to health by being highly energetic and diuretic, horchata is rich in minerals and vitamins, among which phosphorus, potassium and vitamins C and E. But it was especially in the eighth century, when the Arabs entered cultivation in the Mediterranean, calling it “tiger nut milk ‘direct predecessor of what later became known as horchata, Valencian orchard being very suitable for cultivation (chufa of Valencia), requiring loose sandy soil and mild temperatures. A legend says that its name comes from the time of the conquest of Valencia. The drink was offered the crown to King James I of Aragon the Conqueror at the entrance to Valencia for a maid of the Valencian orchards. By testing the taste, Jaime answered “Això és or, xata” which means “This is gold, petite.” But this picturesque story is false. The etymology leads to authentic Latin hordeata of hordeum, meaning “barley“. Originally, then, the horchata was a barley water. 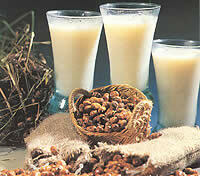 Over time, the name was applied exclusively to made ​​with chufa. The development of horchata begins with washing the tuber, then going to a mill for grinding, may be a time in maceration, pressed several times and you get the final extract. To complete the process you add sugar and sieved again.